Georgetown, Colorado is a former mining town. 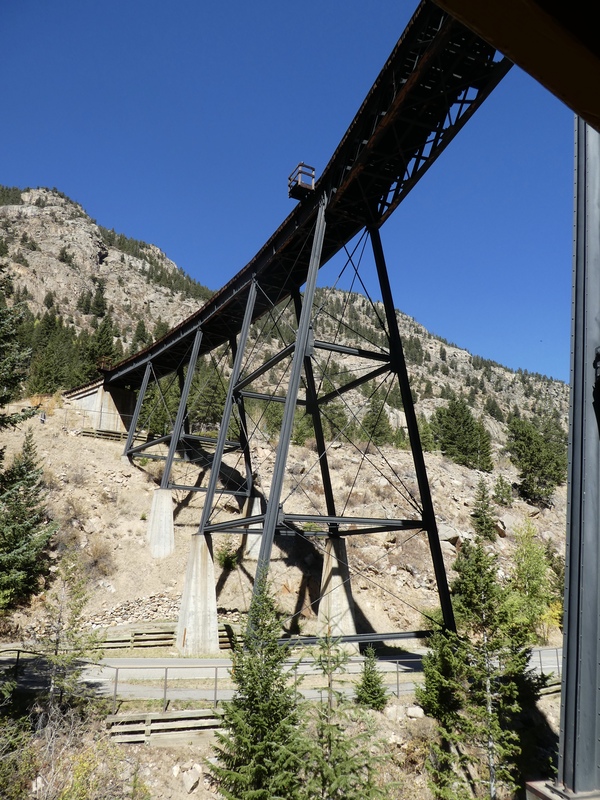 In 1884 a narrow gauge train was completed to connect some mining towns. At the time, this train was considered an engineering marvel. 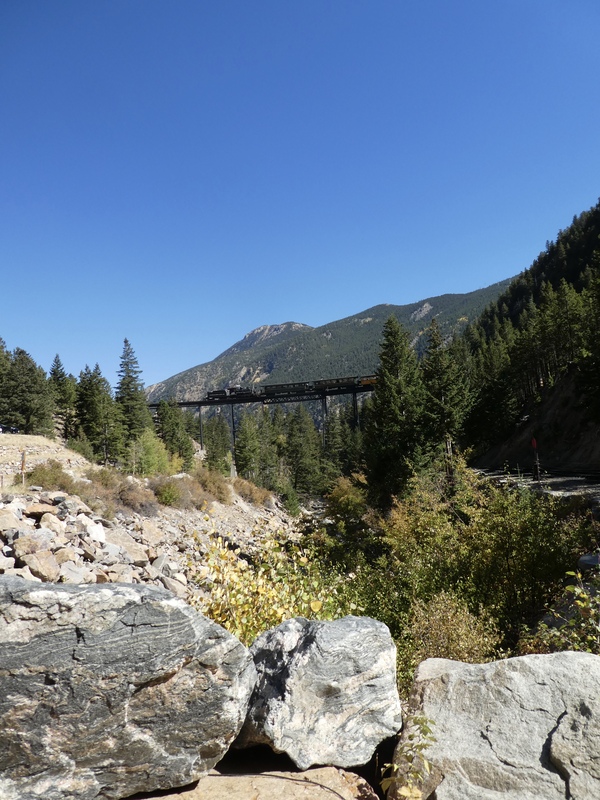 There were horseshoe curves, 4% grades, 4 bridges across Clear Creek and Devil’s Gate High Bridge. 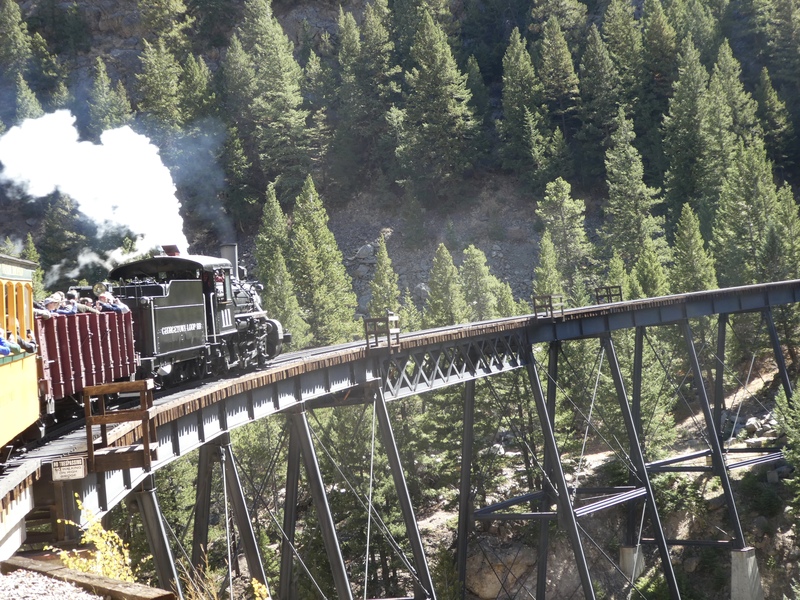 The distance between Georgetown and Silver Plume was only 2 miles (3.2 km) but the train traveled 4.5 miles (7.2 km) to go through the narrow canyon between the two mining towns. Mining ended, roads were built and the train was dismantled in 1939. But during the 1980’s, the train was restored and is now a tourist train. Inside the building we will get our tickets. We did make the recommended reservations. We are glad we did. It is a very full train, and we went on Wednesday. We leave the ticket and gift shop and wander around. 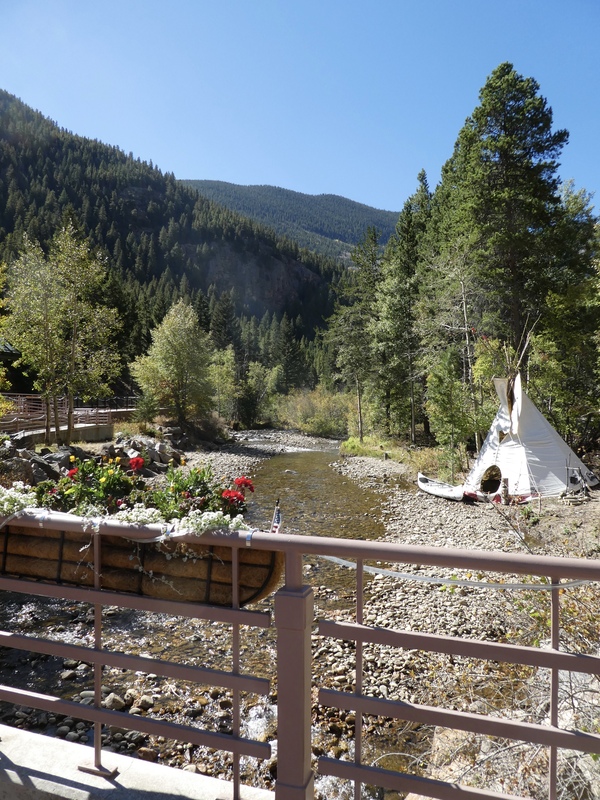 From the bridge over Clear Creek, we admire the canoe and tepee. 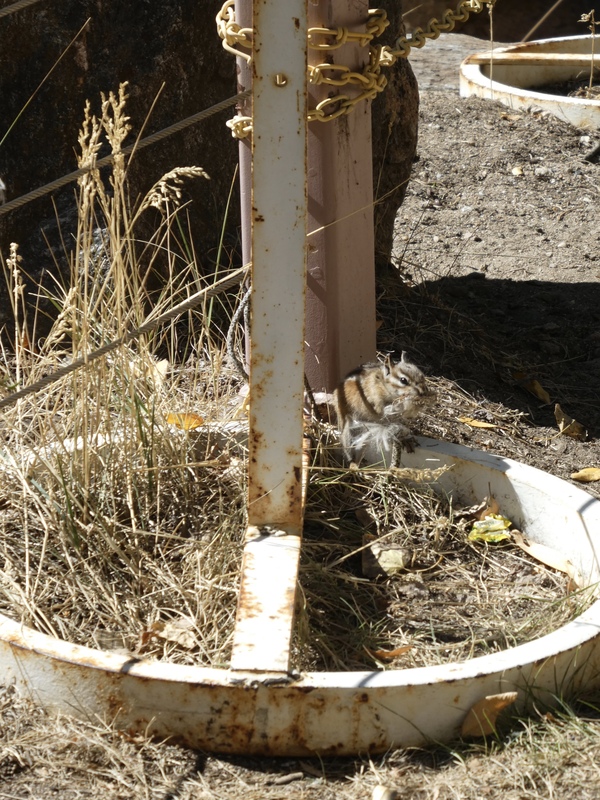 And we see a small native Colorado animal. We love chipmunks. This one is chewing something. His nose is wrinkled up. 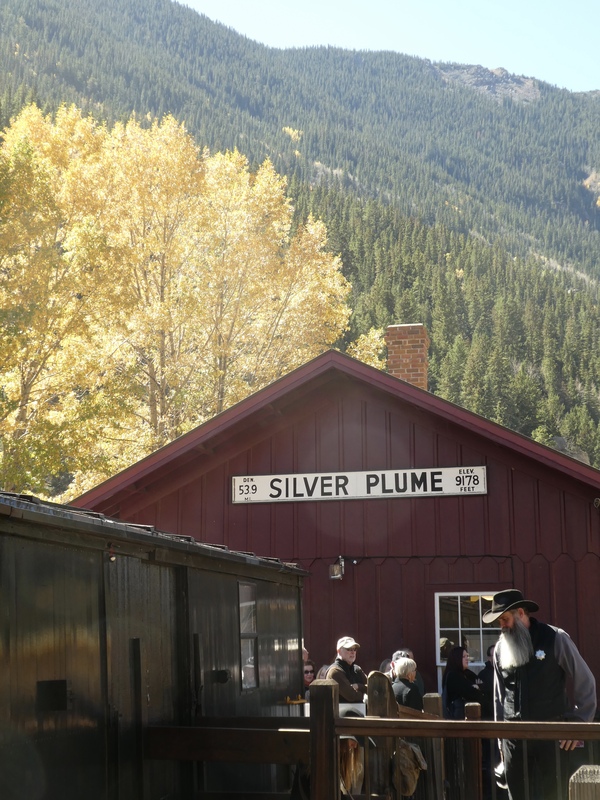 The train is coming from Silver Plume. Some passengers will get off and stay here, most will get off for about 10 minutes and then get back on. Mom, our friend and I, Zeb the Duck, are on the train. On train. More passengers coming. I do have two eyes! More passengers are coming. There will not be pictures of me on the train. The rails are not level and I don’t want to fall off. Also mom can’t take good photos with the sun behind me like this. We are moving. From the lower track we look up to view Devil’s Gate High Bridge. Winding around the station, we are now going on Devil’s Gate High Bridge. We rode this train a couple years ago and I love it. It is wonderful that we are riding again. The scenery from the train is beautiful. 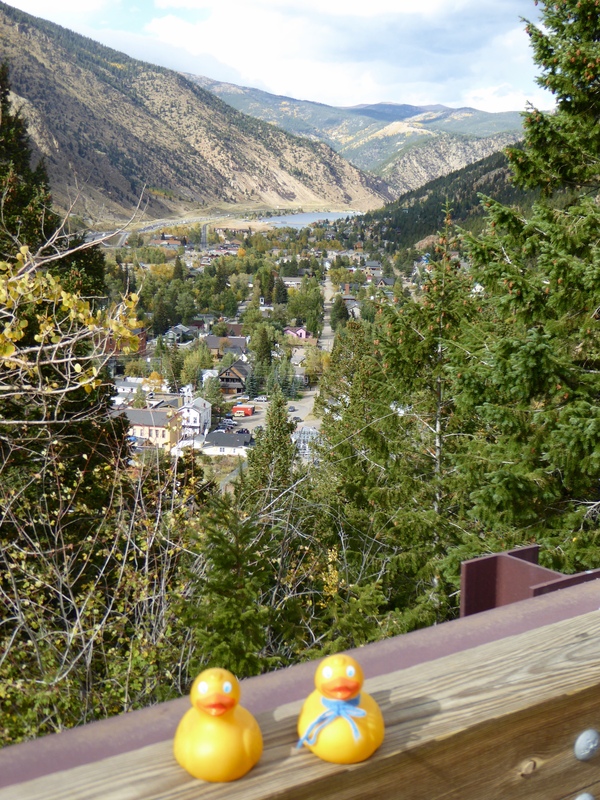 We are in a mountain canyon in the Colorado Rockies. Pulling into Silver Plume station, the conductor tells us we have about 10 minutes here. We don’t go far. Some people started their train ride here, so they get off now. Maybe a few new passengers join us. 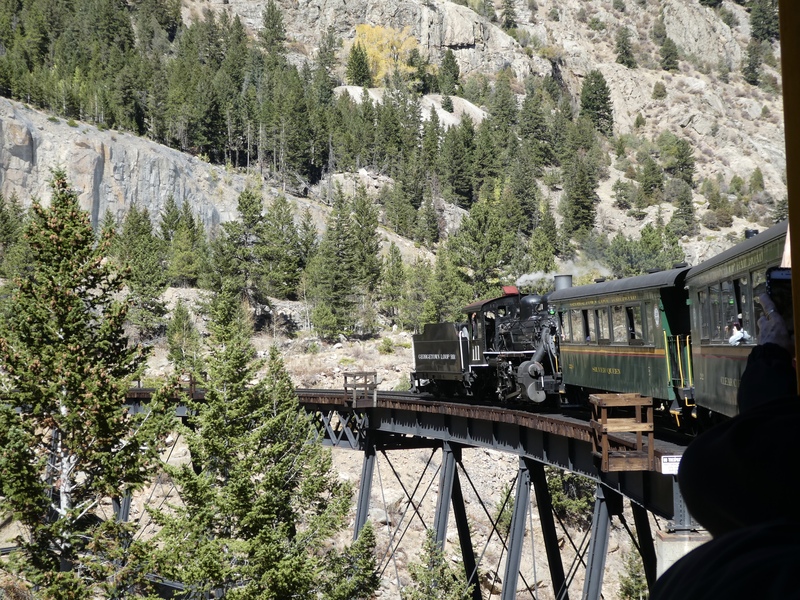 Our train crosses Clear Creek 4 times each direction. 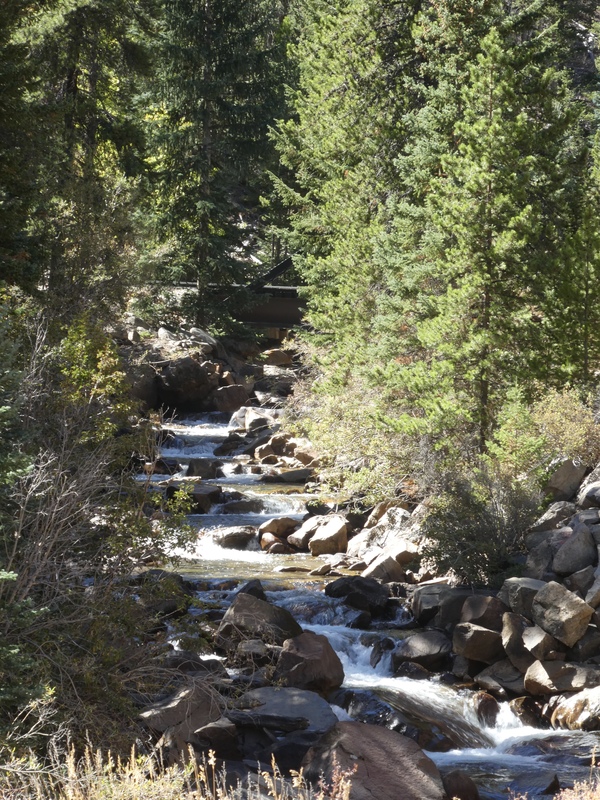 This is one of my favorite views of Clear Creek. When the first railroad was build in the 1880’s there were no machines to move rocks. 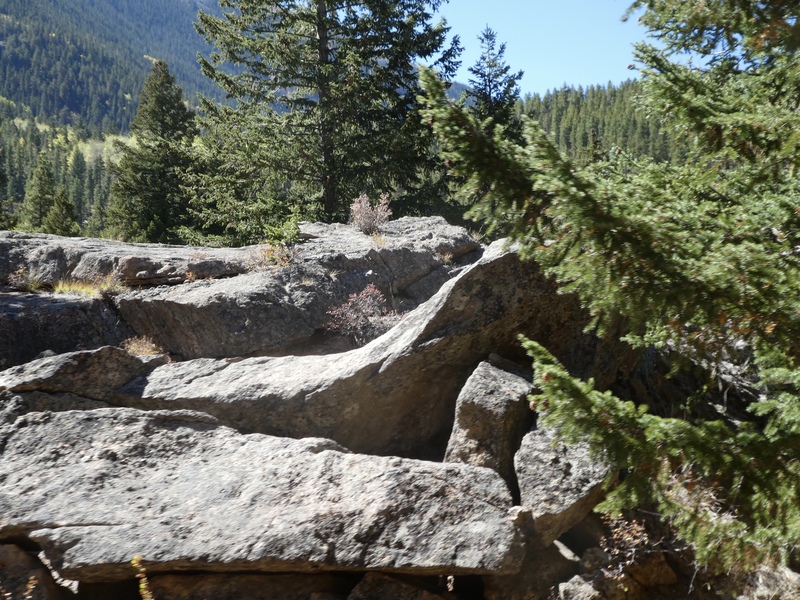 These boulders were all move by human hands. We are almost back to Devil’s Gate station, our starting point. 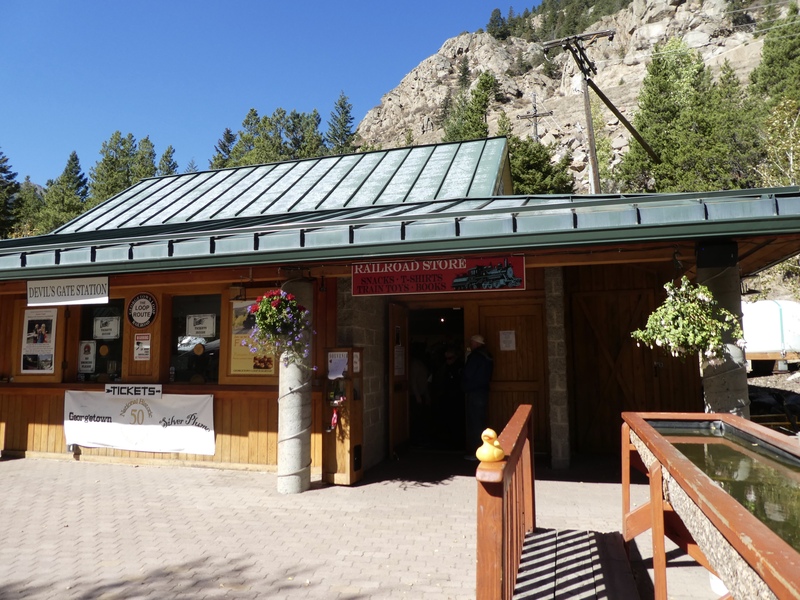 There was a stop for humans to get off the train if they purchased tickets to visit an underground mine. We did not. We want to drive through the mountains when our train trip is finished. 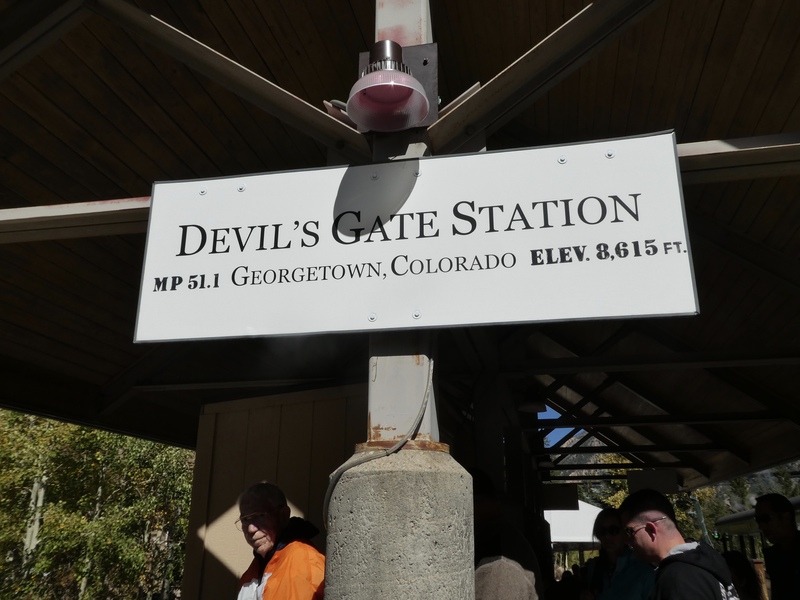 We have arrived at Devil’s Gate station and we must leave the train. 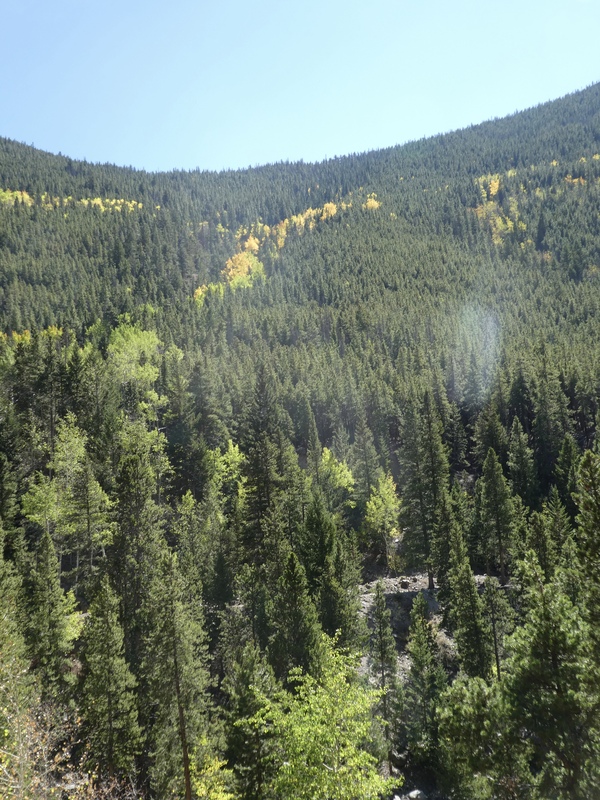 But we saw something between Clear Creek and the Rocky Mountains. Off the train, we need to explore. Yes, we did see deer. 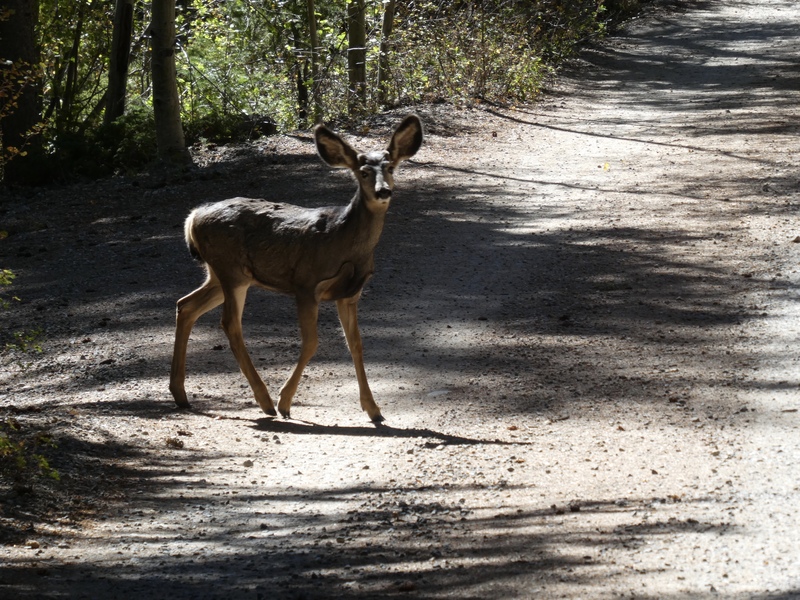 This is a young mule deer. Just love those huge ears. There are 4 deer here. We stood very still and all four of them crossed the road in front of us and gracefully climbed into the mountains. Back in our car, we drive behind Georgetown. 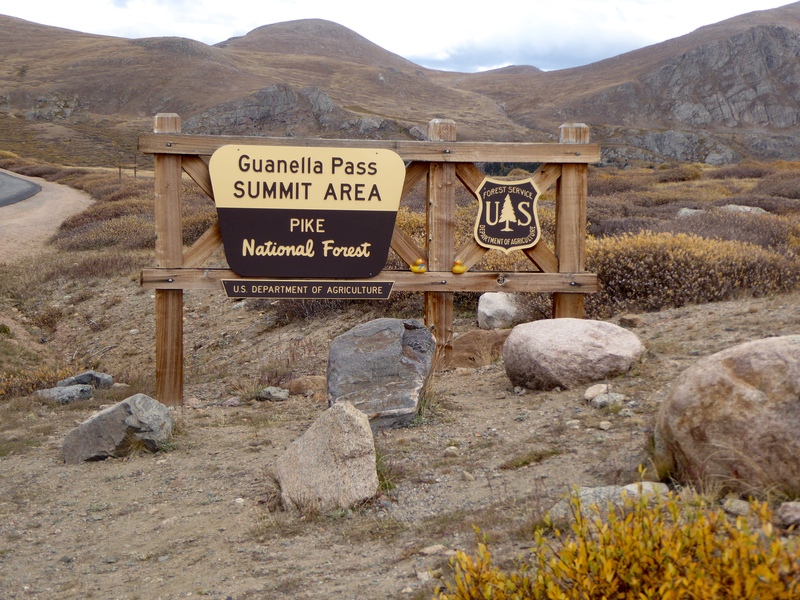 We will go over Guanella Pass and arrive in Grant, Colorado, on the other side of the Continental Divide. Driving up the pass, we stop to look at Georgetown behind and below us. 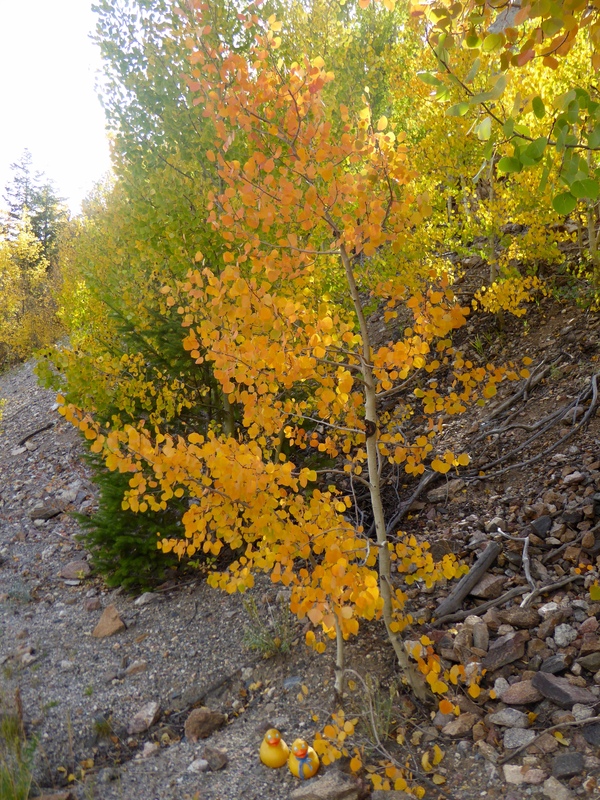 The aspen trees are changing colors now. Some leaves will still be green, some bright yellow, some gold and some red. At the top of Guanella Pass we stop to admire the view from the top. Guanella Pass area, above timberline. Again, we are above tree line as we are on the top of the Continental Divide. Going down toward Grant we stop to admire Geneva Creek. This is a great day. The Colorado sun has been shining much of the day. We love the train. And our Colorado mountains are beautiful. The train was less than an hour from home and Grant is about 90 minutes from home. We hope you explore and enjoy areas around your home also. 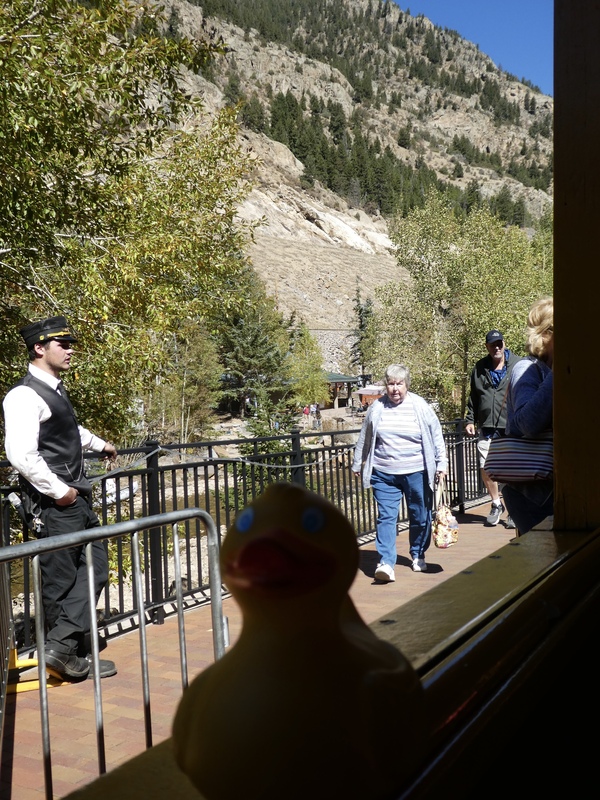 This entry was posted in Colorado, Uncategorized and tagged chipmunk, Clear Creek, Colorado, Colorado Traveling Ducks, Devil's Gate High Bridge, Geneva Creek, Georgetown, Georgetown Loop Train, Guanella Pass, Silver Plume. Bookmark the permalink. It’s great to know this train ride has been revived. The scenery along the way is beautiful with a touch of autumn colour. It is a good ride. Beautiful scenery in any season. But it was perfect that day. 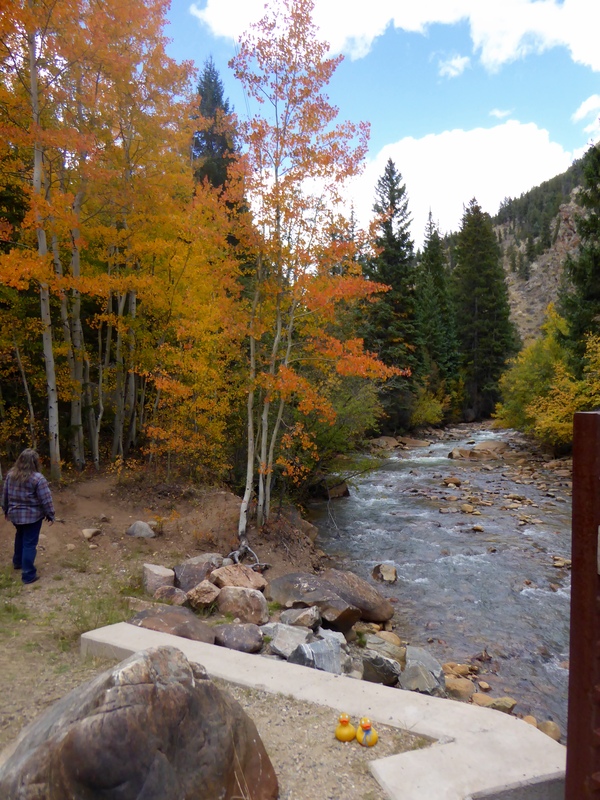 Warm weather, clear skies and the changing leaves on the Aspen trees. Also glad train is running again.